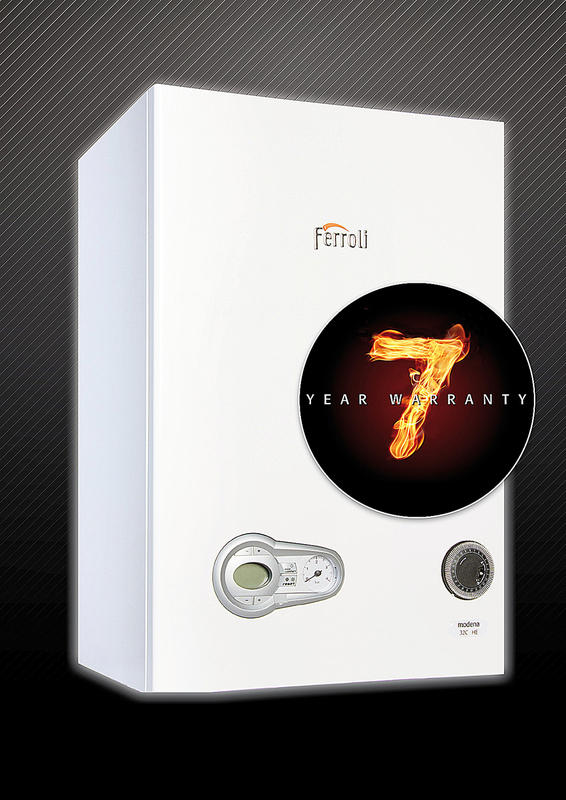 Ferroli has added yet another great benefit to the incomparable Modena HE range of high efficiency condensing boilers with the option of a seven year parts & labour warranty. The Modena, which is the smallest and lightest complete combi boiler on the market, can now be purchased from January 1st 2014 with the choice of a 7, 5 or 2 year warranty. There are no strings attached and you simply ask for the warranty you want at the merchant trade counter. Increasing numbers of installers have been switching their allegiance to the Modena from their previous preferred model when they discover they can buy a boiler with a five year warranty at such a good price. The new option of a seven year warranty is further proof of the boiler’s reliability and superb build quality. A feature that is unique to Ferroli boilers is the stainless steel bi-thermal pipe-in-pipe heat exchanger, which is one continuous loop that eliminates weak points and minimises potential failure; it also eliminates the need for the traditionally problematic diverter valve. Another very desirable feature is that the pump is not required for hot water because the DHW flow switch activates the PCB and the pump does not move. Also unique to the Ferroli Modena boiler is the fact that the standard pump has been designed so that modulation is available via the PCB in readiness for the second phase of ErP regulations which come into effect in January 2015. The Modena HE range comprises 27kW and 32kW combi and 18kW, 25kW and 30kW system models. All are available for natural gas and LPG. Click here for more information on the Modena HE range.